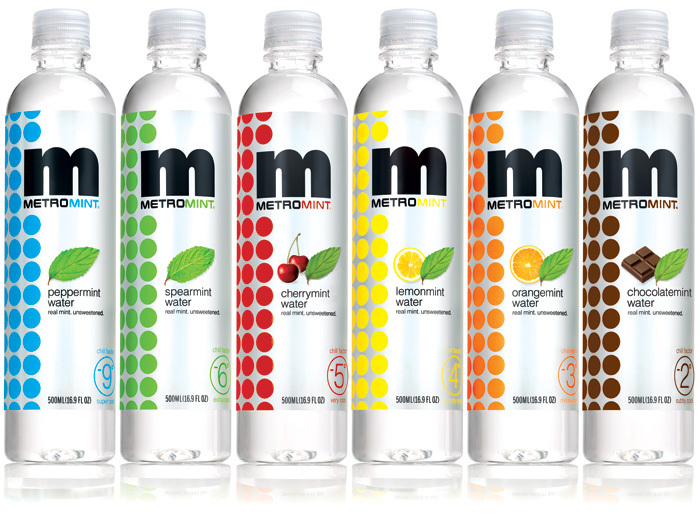 I'm generally skeptical of flavored waters as they usually taste more like flavored seltzer waters that have gone flat. 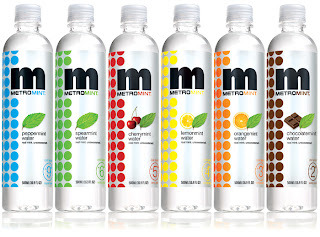 But boy, is my newly-discovered Metromint water a refreshing change! Courtesy of mint grown in Washington state's Yakima Valley, essences such as full-bodied berry, orange, lemon (and chocolate!) are infused with cooling bursts of the stuff that also chill out in the refrigerator to incredibly thirst-slaking perfection. Oh, and there are no calories--or anything really, except great flavor--so drink to your heart's hydrated, summery content. Try all flavors: original Peppermint, Spearmint, Lemonmint, Orangemint, Chocolatemint, and Goodberrymint. Go to metromint.com for more info. This month our group of indomitable players embarked upon Blithe Spirit, by The Master himself, Noel Coward. 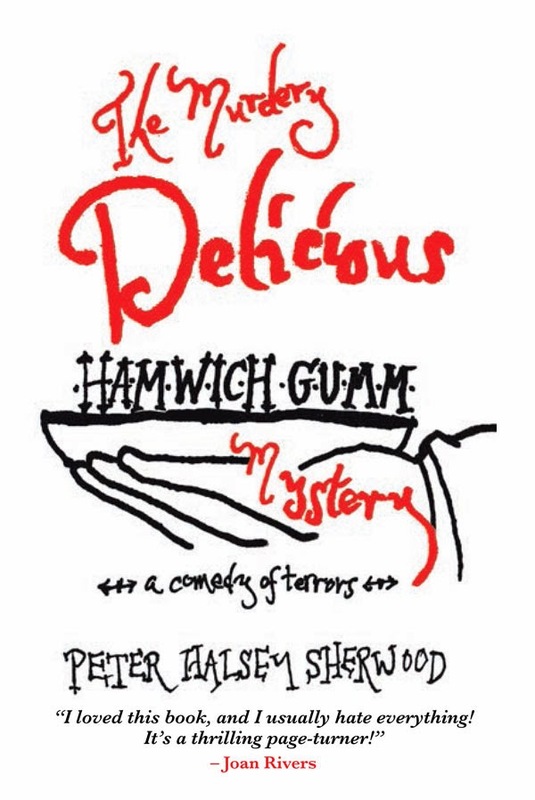 The brilliantly wicked "improbable comedy" surrounds the supernatural and a stolid British gentleman who can't seem to stop arguing with (or indeed get rid of) two of his dead wives. Before we got to the curiousness afoot, we toasted with frozen shots of my own creation, the Blithe Spirit. Baby flooded the punch bowl with dry ice to set a vaporous, otherworldly mood, evoking an emanation perhaps, or any sort of protoplasm. I adjusted my cocktail recipe, though--as we didn't have coconut-flavored Malibu rum, I used what dark rum we did have and switched it up with Zico coconut water poured into the mix along with Simply Limeade instead of Rose's lime juice. Add a judicious amount of orange juice and do throw in fresh mint leaves too. A view of the table from the perspective of a mischievous fern! Martini glasses and a host of pearls spilling out of them seemed appropriate to decorate a veddy British table. Pearls do lend to one a fair amount of courage, don't you find? An upturned mirror was the best I could do for a summoning crystal ball. 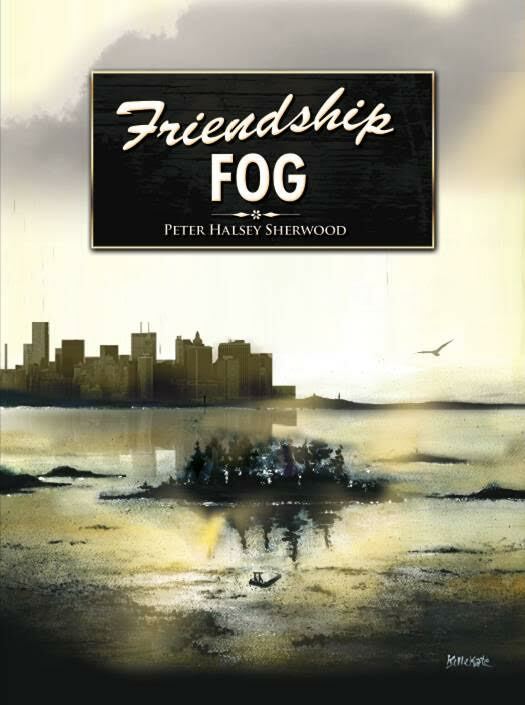 Funnily enough, at least a few mysterious events did occur, such as the sudden, murky rain storm that poured down and thrashed about, forcing us to close the windows--and the ice-filled wine bucket that gurgled inexplicably while we read over certain lines! Mousse Truffee-chicken and turkey livers in duck fat and truffles with Carr's water crackers. Cucumber Sandwiches--I didn't make my usual Benedictine sandwiches with cucumber and cream cheese. Fresh Direct had tzatziki with cucumbers and yogurt already made, so I used that. I did still cut off the crusts of the white bread though. Potato Salad--thanks again Fresh Direct! Watercress Salad with Wild Mushrooms--I tossed it all with the ready-to-go Delouis fils shallot vinaigrette. Chimichurri Marinated Flank Steak--it arrived from Fresh Direct ready to cook. All I had to do was put it in the oven heated to 350 degrees until the meat thermometer reached an internal 135 degrees and I let it sit out of the oven so it could further climb to about 145 degrees for pink, medium rare perfection. We ate it at room temperature, suited for summer. Strawberry Rhubarb Pie with Haagen-Dazs Vanilla Ice Cream--a homemade delight, courtesy of our dear friend. 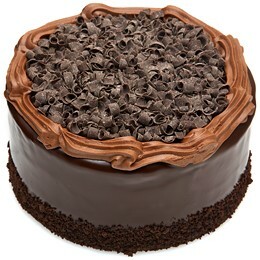 Chocolate Mousse Cake--well, what to say, but thanks again Fresh Direct! What an evening of high spirits! Although it may seem a tad presumptuous to name a restaurant Triomphe, the moniker does readily translate to a “triumph” at the hands of chef Jason Tilmann. The room in the Iroquois Hotel is cozy and warmly lit, a classic New York supper club, if perhaps not as grandly outfitted as Tocqueville or the erstwhile Lutece that it might choose to evoke. While being forward-thinking in his preparations, Tilmann definitely has a refined, reverential respect for Manhattan’s vivid history and culinary legacy. House cocktails filled with Stoli Orange and ginger beckoned. An English Sparkler with Tanqueray gin, St. Germain elderflower liqueur and Prosecco was especially promising. 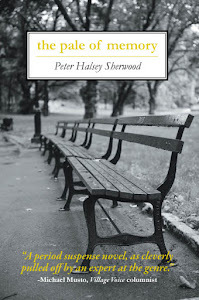 However, we planted ourselves firmly into some brightly tart Sidecars and bracing martinis. It was love at first bite when our chicken livers arrived, so plump and perfectly fried over toasted garlic crostini, along with onions braised in sherry with a bare trickle of fruity basil olive oil. A mound of cleanly chopped hamachi tartare was served on a chilled plate with a flowery bouquet of baby mache lettuce while pearls of salmon roe further decorated and endorsed the dish. Scallops on our other fish course were subtly seared and topped with porcini mushrooms. Foie gras butter melted onto the fish and continued to commingle with the surrounding thyme cream sauce, which we were told is made fresh with every order. The two salads we tried were in turns confounding and illuminating. Overly salty smoked trout argued with other competing flavors such as briny, pickled ramps and a strident grain-mustard vinaigrette. We took solace in the wonderful retro wedge of iceberg lettuce thrown over the top by accommodating portions of lobster; firm, spring-summoning English peas; thyme bacon; blue cheese sauce; tomato dressing and a drizzle of mint coulis. Chateaubriand was a special, so we stuck our forks right in. The richly red, thickly cut tenderloin of beef with a giggle-inducing béarnaise sauce benefited by a soupcon of mustard was quite extraordinary—one of the best steaks I’ve had in recent memory. A heady whiff of truffles laced the accompanying mashed potatoes while the veal demi-glace got its game on and stiff stalks of jumbo asparagus rounded out the dish. Surprisingly enough, we didn’t stop there. After all, dessert and fine glasses of nostril-filling Larressingle XO Armagnac awaited. Usually I don’t dally with sweet after-dinner drinks but the Lemon Chiffon with Stoli Vanilla and limoncello and the Caramel Macchiato with Godiva caramel, espresso and vodka were certainly up for consideration. We skipped the cinnamon apples and almond granola mixture listed as the topping for New York cheesecake, shrewdly opting instead for a scoop of delectably icy blueberry sorbet to pair with our creamy, gorgeous snowball. We wanted to kiss our waiter for insisting that we try the chocolate croissant bread pudding with caramel toffee gelato and a judicious pour of warm Crème Anglais on top. How cheering and reassuring to discover that in the stalwart Iroquois, Triomphe is so freshly delivered and fully earns its name. Prices: Appetizers: $11-$18; Entrées: $31-$40; Alcohol: beer, wine, full bar, specialty cocktails. 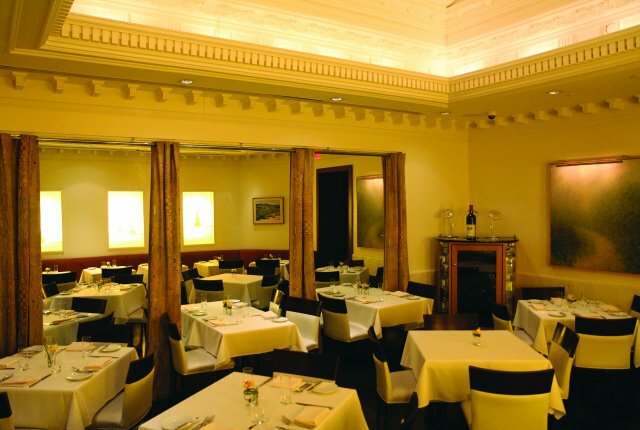 Short Order: Triomphe delivers a classic, New York moment in a comfortable room that all conspires to make for a triumphant evening. Peter’s Picks: Perfectly fried chicken livers; over-the-top lobster salad; extraordinary Chateaubriand steak; scrumptious chocolate croissant bread pudding. Peter’s Pans: Competitive smoked trout with pickled ramps; vinegar and grain mustard. There's nothing like getting together with a good old friend, is there? Baby and I hadn't seen dear Penelope in what felt like ages or at least months. We finally rallied 'round to have lunch together at our place. And like the best friendships we know, if we are lucky to have them, we caught right up and resumed our conversation like we had only left each other moments ago. I wanted to pull together something simple but elegant to befit our fabulous friend. While considering what to make, I set an appropriately seasonal table, sort of like a lawn party (note the AstroTurf coasters!). As other friends had just brought over glorious pinkishly tinged gerbera daisies with greenly vibrant leafy stems, that was a finely inspired scheme to lay out the luncheon, with green Patrician Depression plates, wooden bowls, matching hand-stitched floral napkins, and brightly colored shades of Laguiole serving ware with buzzy bees on the hefts that seem to summon summer. Refreshing Tanqueray gin cocktails straight up with St. Germain elderflower liqueur and thyme sprigs got the ball rolling before we settled into a relaxing afternoon of wine and roses with a bottle of a Domaine de Paris Cotes de Provence rose wine. Celery Victor Such a gorgeous dish! I traded up a few things here. I used court bouillon stock for extra flavor when simmering the celery, and then made the dressing with a cube of dissolved chicken bouillon. Open-Faced Whitefish Sandwiches Adapted from the kitchens of Martha Stewart Living, what I made was a riff on a recipe from the Everyday Food publication where smoked trout with a Greek yogurt-cucumber-dill dressing is what's called for. I didn't have the time so I just cut to the chase and bought really good whitefish salad, already made. Slices of sturdy bread are brushed with olive oil and lightly toasted in the broiler before being topped with leaves of either butter or Boston lettuces (the actual recipe lists romaine) and a scoop of the salad. Cubed beets and chopped chives as an additional garnish is my own suggestion--and very good looking, by the way! Mustard Potatoes Also from Everyday Food, these potatoes were very easy to make. Boil 1 1/2 pounds small red potatoes in salted water until tender, about 10 minutes. When they have cooled down, cut in half. Whisk together 2TB olive oil, 1/2 teaspoon lemon zest, 2TB mustard (I used Roland's extra strong Dijon, not whole grain) and 1 TB hot water. Toss all together and put in a little salt and pepper while you're at it. A great side dish. Strawberries and Blueberries with Coconut That's all you need to know. Shop for the best berries you can find, snip off the tips if need be and throw in some shredded coconut.